Innovative 9110-8460 is a secure wire shelving monitor mount bracket that provides the flexibility to tilt, pivot, and rotate the flat panel monitor. 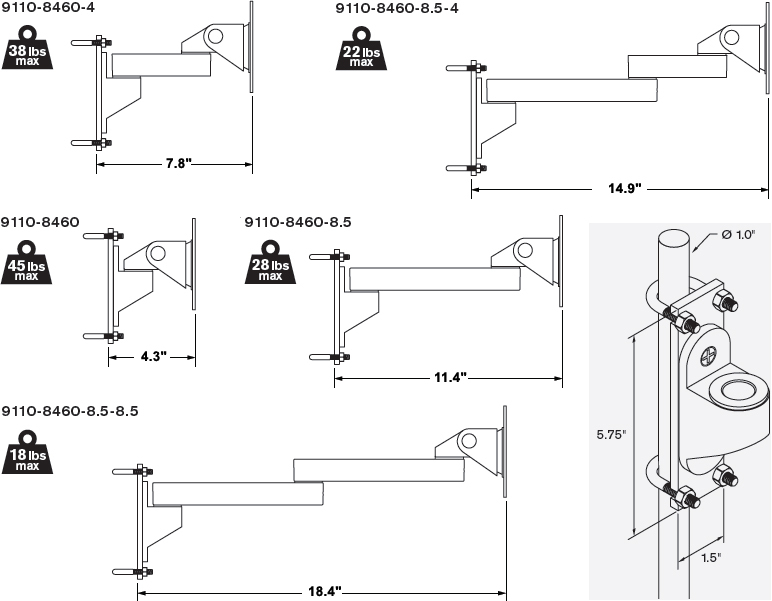 The 9110-8460 monitor mounting bracket is ideal for hanging monitors in IT server rooms, food service areas or industrial spaces that use wire shelving or racks. Secure the monitor to a 1" diameter wire shelf post using this mounting bracket. The 9110-8460 offers tilt, rotation and pivoting of monitor. 9110-8460-4 includes an articulating arm; increases extension up to 7.8". 9110-8460-8.5 includes a long-reach articulating arm; increases extension up to 11.4". 9110-8460-8.5-4 includes two articulating arms; increases extension up to 14.9". 9110-8460-8.5-8.5 includes two long-reach articulating arms; increases extension up to 18.4"
Question: I need a wire shelf mounting device that can house a monitor using VESA-compatible mount kit (100 mm x 100 mm). I would also need a keyboard/mouse mount for a wire shelf as well. 9110-8460 Wire Shelving Monitor Mount has an option for keyboard tray. Does this tray need its own mounting arm or can this connect with the monitor mount as well? Answer: You have two options to add a keyboard tray to your Innovative 9110-8460 Wire Shelving Monitor Mount. The Innovative 8085 Left or Right Handed Keyboard Tray uses an entire arm while the Innovative 8209 Flip-Up Keyboard Tray will attach to the Wire Shelving Monitor Mount but also leaves open 75x75 and 100x100 mounting pattern holes to add a monitor. Keep in mind the Innovative 8209 Flip-Up Keyboard Tray adds 9 lbs so this number of 9 lbs would need to be deducted from the maximum weight capacity of whichever arm+extension configuration you chose.